Freak power was formed in 1993 by Norman Cook and Ashley Slater. It was the greasy, illegitimate love child of Beats International and Microgroove. The album was initially released on 4th and Broadway in 1993, with the first single, Turn On, Tune In, Cop Out being released in the spring of that year. It achieved a chart position of 23, and as a result of that, the track was released on a few ‘Acid Jazz’ compilations. While the editor for the current Levi’s campaign was waiting for an approval from Donna Summer’s people to use I Feel Love (which was denied as, allegedly, Ms Summer felt uncomfortable with the content of the ad, it featured a very convincing transvestite having a crafty shave in the back of a New York Yellow Cab, the editor proposed to the agency that they use TOTICO instead. They agreed and the single was released again in 1995, when it achieved a top three position in the UK charts. (One chart said it was number 1, the other said it was number 3, so we’ll settle on number 2). Freak Power went on to release another couple of singles from Drive Thru Booty, and Rush attained quite high chart positions across the world. The band went on to record another album at Compass Point Studios in the Bahamas, More of Everything for Everybody, which was not as successful, but still garnered critical acclaim from critics around the globe. At that point, Norman had begun to achieve some success with Fatboy Slim, and he left the band to focus on that project. Ashley provided a few vocals on the FBS records, but it seemed that Freak Power was finished. Fast forward 20 something years, and Ashley is back with a Freak Power band which is more energetic than the original (that’s what happens when you get a great guitarist in) and features some of the great original players from early Freak Power and Microgroove days. Their set is powerful, energetic and lyrically, still annoyingly timely. They play tunes from across both albums and also incorporate new material from their recent EP, United State. 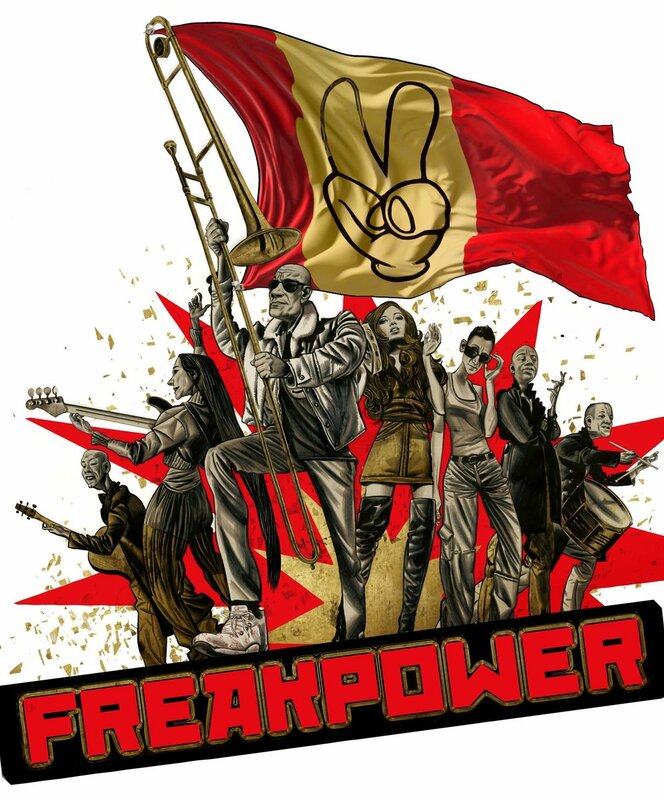 Freak Power toured Europe extensively last year, but nothing this year because of Brexit, so you can catch them in the UK over the summer!